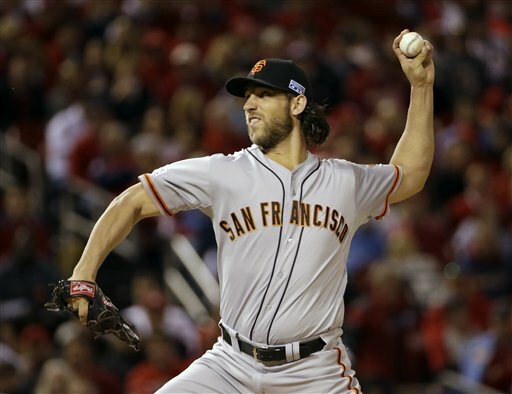 ST. LOUIS (AP) — Madison Bumgarner pitched shutout ball into the eighth inning and the San Francisco Giants combined just enough hitting with a couple of defensive flubs by St. Louis to beat the Cardinals 3-0 Saturday night in the NL Championship Series opener. Bumgarner set a major league postseason record with 26 2-3 consecutive scoreless innings on the road. The Giants lefty was in complete command while 20-game winner Adam Wainwright failed to last even five innings for the Cardinals. San Francisco has won 12 of its last 13 in the postseason, including three straight to erase a 3-1 deficit in the 2012 NLCS against St. Louis. Jake Peavy gets the Game 2 start for the Giants on Sunday night against Lance Lynn. Bumgarner, who began the playoffs by throwing a shutout at Pittsburgh in the wild-card game, gave up four hits in 7 2-3 innings. Bumgarner bested the mark of 23 straight postseason scoreless innings on the road set by Art Nehf of the New York Giants from 1921-24. The Cardinals’ threatened against him only in the seventh on consecutive one-out singles by Yadier Molina and Jon Jay, but Kolten Wong tapped out and pinch-hitter Tony Cruz fanned. The Giants’ bullpen finished with hitless relief as Sergio Romo got the last out in the eighth and Santiago Casilla closed for a save. Wainwright failed for the second straight postseason start. And this time, there was no late comeback against a lefty for the Cardinals — they twice did it against Dodgers ace Clayton Kershaw in the NL Division Series. Wainwright was 20-9 during the regular season, including 5-0 with a 1.38 ERA in September with two complete games and a shutout. He’s piled up a major league-high 512 2-3 innings the last two years, and perhaps the workload is finally getting to him. The right-hander admitted before this series that his pitching elbow had bothered him during a start in the division series, but insisted he was fine. In two October starts this year, Wainwright has permitted eight earned runs in nine innings. He’s 0-4 with a 5.14 ERA in his last five postseason appearances — he lasted 4 2-3 innings against the Giants after going just 4 1-3 innings in the NLDS opener vs. the Dodgers. Bumgarner and the Giants silenced a sellout crowd of 47,201 in a game that began in 55-degree chill. The Cardinals twice failed to seal the deal defensively in the Giants’ two-run second. Third baseman Matt Carpenter’s fielding error with the bases loaded on Gregor Blanco’s soft one-hop liner at his feet was their first error of the postseason. Pablo Sandoval doubled to start the inning when rookie right fielder Randal Grichuk gloved the ball but couldn’t hang on as he ran into the wall. Travis Ishikawa, 0 for 5 with five strikeouts and a walk against Wainwright, had an RBI single on a jam-shot bloop just over Carpenter’s head in shallow left. Wong misplayed a double-play ball at second base in the third, and Brandon Belt’s sacrifice fly made it 3-0. Giants: Getting reunited with Bruce Bochy helped the 40-year-old Peavy turn back the clock. He worked 5 2-3 scoreless innings and won the division opener against Washington, a continuation on a strong finish — 6-4 with a 2.17 ERA — after Boston dealt him to the Giants at the July trading deadline. Cardinals: Lynn has been a solid No. 2 behind Wainwright, an innings-eater who has better learned to take setbacks in stride. He’s won at least 15 games all three years in the rotation, and this year worked three or fewer runs in all but four of his 33 starts, and he’s 27-12 career at home. “I’ll still say he’s probably one of the most underrated pitchers in the game,” manager Mike Matheny said. Michael Morse was added to the Giants’ roster in place of rookie outfielder Gary Brown, but did not play. Morse had been limited to two at-bats since Aug. 31 with a strained oblique muscle. Brown was on the division roster, but was not used.